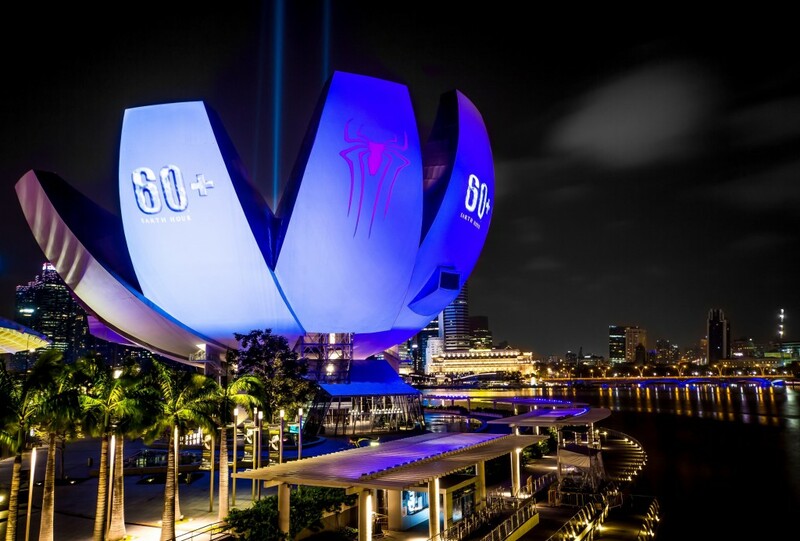 Laservision are proud to have supported Marina Bay Sands in the launch of the largest Earth Hour event to date in conjunction with Sony Pictures. 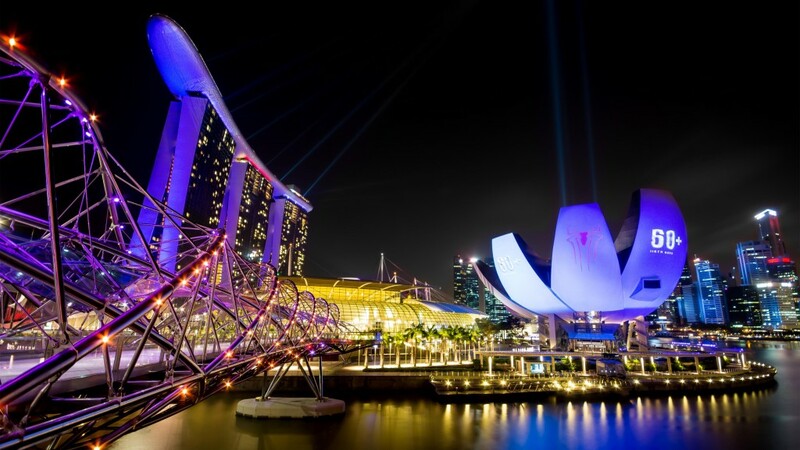 Laservision’s award winning ‘Wonder Full’ Light and Water Show transformed the 40 acre Marina Bay Sands Integrated Resort into a dynamic canvas entertaining the A-List celebrities, media and mass of elated fans. The three water screens, boasting a combined surface area of 2,000 square metres, acted as a centrepiece for Earth Hour celebrations and the revealing of Spiderman as the newly acclaimed, first ever environmentally-friendly super hero ambassador for an ecological cause. Sony Pictures has teamed up with the global environmental group World Wide Fund for Nature (WWF) and their Earth Hour movement, in a ground breaking global campaign to empower people across the world to “Use Your Power” and save the planet. With the imminent release of the next chapter in the Spiderman movie franchise ‘The Amazing Spiderman 2: Rise of Electro’ the cast flew into Singapore along with a mass of international media to launch Earth Hour 2014, sending local fans into elation. Laservision facilitated the projection of an awe-inspiring film onto the water screens which featured the cast of the new movie urging individuals, businesses, organisations and governments to generate environmental outcomes. Splashes of distinctive Spiderman colours were projected in tangent across the Art Science Museum and Marina Bay Sands roof and façade. The skypark underbelly donned an arachnidan armour for the evening via spider web projection techniques. Earth Hour is a global environmental initiative organised by the WWF held at the end of March annually, encouraging households and businesses to take ownership in addressing climate change by turning off their lights for one hour. The event has gained momentum and grown in popularity since the first Earth Hour held in Sydney in 2007. In 2012, more than 7,000 cities in 152 countries observed Earth Hour. Today, Earth Hour has become a symbolic event that brings together the global community in encouraging people to take action beyond the hour. Singapore, at the heart of Asia and as Earth Hour’s global headquarters, is an ideal location to spread inspiration for environmentally sustainable actions to the larger regional community. Singapore celebrated this year’s global flagship event for Earth Hour at The Float @ the iconic integrated Marina Bay Sands Resort, putting the prestigious hotel and country at the heart of Earth Hour celebrations worldwide. The hour was inaugurated by a countdown after which Spiderman (Andrew Garfield) and the rest of the cast (Emma Stone, Jamie Foxx and director Marc Webb) helped to switch off the lights across Singapore’s signature Marina Bay skyline, plunging the city into darkness. Traditionally, the “lights out” activity has been a symbolic act of one’s commitment to saving the planet and conserving the environment. Laservision were thrilled to be engaged to help create a contemporary art installation at the Hong Kong Peninsula Hotel by one of the most highly respected artists of our times, Tracey Emin. ‘My Heart is with You Always’ , visible from across Victoria Harbour, created a focal point along the city’s already dramatic skyline. Laservision, as creators of Hong Kong’s ‘ A Symphony of Lights ‘, the World’s ” Largest Permanent Light and Sound Show ” are not new to making a big impact on the HK city skyline. 46 participating buildings located on either side of Hong Kong’s Victoria Harbour make up ‘ A Symphony of Lights ‘ as they explode nightly into a dazzling display of visual effect firepower. The 14 minute performance aims to highlight the unity of architecture within Hong Kong while educating the audience on Hong Kong’s history and cultural diversity. 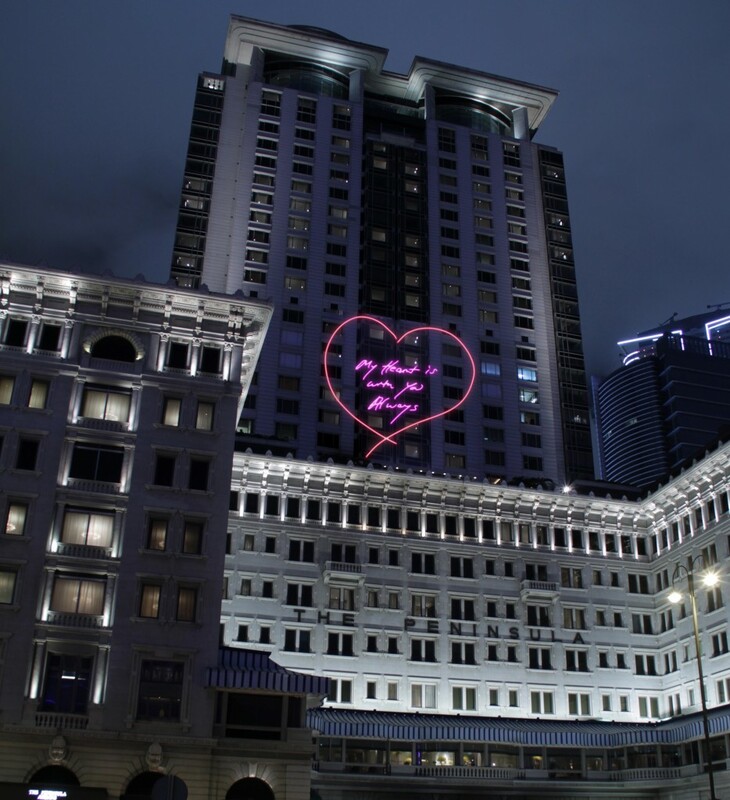 The unique works, ‘My Heart is with You Always’, was shown on the facade of The Peninsula’s famous tower nightly from the 8th to 18th May, in the run up to the second Art Basel Hong Kong. Recognised as one of the world’s renowned contemporary artists, and a leading light of the YBAs (Young British Artists) Emin has created a moving image based on one of her famous neon artworks, featuring her signature handwritten style. The project follows on from Emin’s highly acclaimed ‘I Promise to Love You’ artwork, which lit up the billboards of New York’s Times Square, with digitally rendered neon Valentine’s messages. Tracey Emin uses her life events as inspiration for works that reveal her hopes, fears, failures and successes. The neon artwork which the artist has transformed into a moving animation, ‘My Heart is with You Always’, is a beautiful example of this, suggestive of the opening line of a poem or the sign-off of a love letter, rendered in bright red and pink neon. Laservision is a world leader in Entertainment Communications. Known for their work in Multimedia Attractions, Special Events and Architectural Lighting. Laservision’s original creations are enjoyed by tens of thousands of people around the globe each night. From a one night Special Event to a permanently installed Attraction, Laservision has an enviable track record. With 30 years of active industry experience, Laservision has repeatedly taken 1st place in a host of International Awards. Modern audiences demand more from a spectacular and Laservision delivers! With an approved Government Research & Development facility, Laservision is constantly devising new and innovative ways to materialise the creative. Laservision Usher in The Year of the Horse at The Venetian Macao! ‘Wonder Full’ Receives Prestigious Tourism Award!